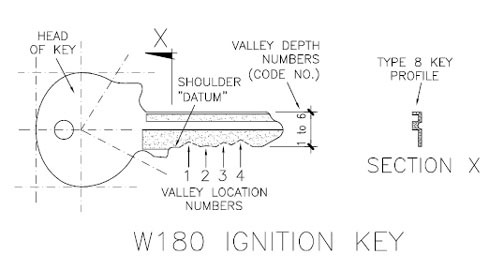 In the course of getting new keys cut for my 1956 Mercedes-Benz Type W180 220S, I learned a bit about ignition (and other) keys and their codes. As a result I thought it might be useful to pass this on, being a small piece of hopefully useful information for fellow International Ponton Owners Group (IPOG) members to use, (always with caution), in the course of their own care and maintenance on these great cars. I'll break this down into sections which will refer to the accompanying diagram which I prepared to go with this item. This information therefore is primarily directed at owners wanting new or 'original' keys for their cars. My experience is that you must be careful that you don't, even inadvertently, end up with a 'direct copy' of your original key(s). 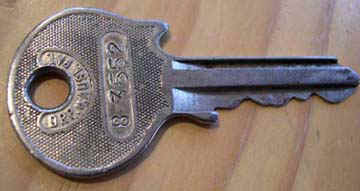 In general you won't want to copy a 50-year-old key, which will include the accumulated wear of all those years! The locksmith must be a professional in his work. He must be able to access known MB car key code information and he must have the correct key 'blanks' in his stock. The best are usually made of nickel silver, being 'kindest' to the lockset. Known and respected ignition key blank brands include 'Neiman' 'DL' and 'Silca'. There might be others. I checked, and checked again, (including with another Ponton Group owner), regarding the best source for such keys. Even so, I had a somewhat uphill battle to achieve the above. This is however not necessarily the fault of the locksmith but more, just the passage of time. 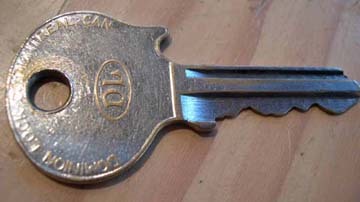 The original key codes for the models noted above are stamped on the original ignition keys straight across the 'handle' or 'head' of the key. They theoretically should match those found on the Original Data Card, available free of charge, currently anyway, from MB Stuttgart. They are a 5-figure number. See below. The vehicle Data Cards have changed format with a somewhat maddening regularity over the years, but for the above models the ignition key code is found centrally on the second-last line of the Data Card information. The item is labeled "Lenkungsschloss." You could also refer to the Data Card page which include an English version of my car's original information. For the record, I enquired with my local and respected MB dealer who advised (Jan 2005) that MB no longer do key replacement for these older cars. They are pretty vague about when the 'cut-off' date might be. It seems that they enquire with MB Stuttgart whenever an enquiry is received. At a guess I'd say they have had a few compliance problems where ignition key information is, for whatever reason, no longer as per the data card. Editor's Note: See the Links page for vendors who may be able to provide blank keys. I started out with very little information on this subject so there were a few guesses. In addition original information was not easy to locate. But about two years after first compiling this item I was given some information by a qualified locksmith in Canada who had discovered our website. So I pass on my accumulated information which I believe is fairly accurate. On one of my cars the Key Codes (as determined below), do not match either the Data Card information or even the number stamped on an older Neiman key! On another car, which is very original, the Code on the key is correct. Refer below for the reasons for this. Take care therefore if you were to quote stamped or Data Card Codes and get new keys shipped on that basis. Referring to the sketch above you will see that the 5-figure key code consists of two main parts. The 'profile' or cross-section identifier is the first number, in this case 8. I haven't investigated other profiles but I suppose there could be up to 9 profile types. The other part of the number is the set of four numbers which define the depth of the four valleys along the toothed edge of the key, counting in order from key HEAD to key END. The SHOULDER of the key, (adjacent & left of valley number 1 above) could be regarded as the Datum, and measures 8.9mm (.350 inch) from the BACK of the key, the top as drawn above, (but see below some slight variations which I've measured). This table can be used to ascertain the Code of your key. Carefully measure, using suitable calipers, each tooth depth between BACK of key and valley. By comparing with the table above you can then directly determine your code. It will be useful to also measure the shoulder of the key. If different from 8.9 mm (0.350 in.) then just adjust the other readings by a similar amount. 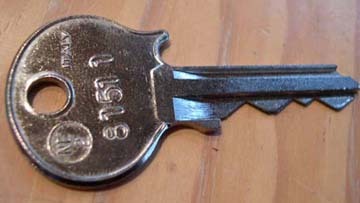 This set of depths is the information that the locksmith will use to cut new keys since key-cutting machines are set up to require the depth across the key from back to front. It was originally impossible to identify the actual current Key Code for my keys, so for my 220S I just had copies made of the originals! But importantly, the locksmith fractionally decreased the depths which he cut, to account for some wear on the original. These work extremely well and far better than the originals. See also the table above which shows that this key is exactly "correct" compared with the predicted dimensions. Only an experienced locksmith could achieve this 'guesstimate' and get it to work in the lock. The issue of wear is not clear-cut (pun not intended), by the way. 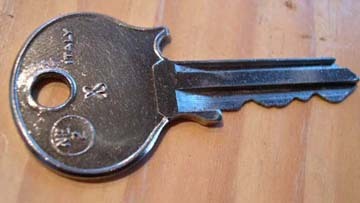 It occurs in the lock as well as on the key. And it occurs within the valleys of the key due to the nature of the action of the pins in the lockset; they bear on the valleys not the teeth. There is clearly also going to be wear on the teeth but in fact this is less important to the operation of the key in the lock. Finally, a quality locksmith can and would rebuild a lock if necessary because of wear, but it would need to be removed from the car first. In doing this it would then be possible to reset the lock to it's original Data Card key code. In preparing this article and its later revisions I have relied on some excellent measurements and observations on Ponton and other Mercedes-Benz keys made by Steve Begin, a trained locksmith from Ottawa in Canada. I need to also add the rider that this information should be used with caution, and that the user takes responsibility for any and all information used. If you are able to add further useful information please contact the undersigned.